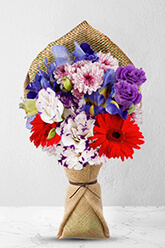 When you can't decide what flowers you would like to send this generous mix of colourful Chrysanthemums, Gerberas, blue Iris and Eustoma make this the perfect selection! Its pure exuberance is sure to be perfect for any occasion.Vase not included however, we suggest including a Premium Vase with your gift to make the overall impression a little more fancy. Was an easy process from start to finish.. A variety of beautiful flowers & arrangements to choose from & accessories if want to, & payment easy process. Delivery was very on time & recipient & me were very happy ! Excellent process & So easy.. It was the morning of my husband's PA birthday, so needed to send her flowers quickly... & zflowers came to the rescue quickly & efficiently with a beautiful bouquet., which she was impressed & happy to have received. Great reliable prompt delivery of beautiful flowers.